Last night I walked into Red Eye Theater (a new venue for me) to find the large open stage area strewn with dried leaves, backed by a fence with bare trees painted on it. It set the scene for a delightfully spooktacular and silly story to play out in an innovative way - Walking Shadow Theatre Company's new version of the short story The Legend of Sleepy Hollow. While parts of it I didn't quite get as much as the rest of the audience seemed to (similar to how I feel when I try to watch Saturday Night Live - I just don't get it), there are also parts that I found to be funny and whimsical and clever. Written by co-Artistic Director John Heimbuch and directed by Jon Ferguson, it's inventive and creative storytelling, which I always applaud. 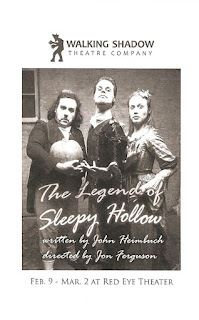 You all know this story - 18th century schoolteacher Ichabod Crane arrives in the small New England community called Sleepy Hollow. The town is full of ghost stories and legends, including the one about the headless horseman who haunts the woods. Ichabod vies with a local man Brom Bones for the affection of the lovely young Katrina Van Tassel, and soon becomes a ghost story himself when he supposedly encounters the horseman and disappears without a trace. Walking Shadow tells this story with exaggerated dramatic effect - audible gasps, extreme facial expressions, and wild gestures - which makes it more campy and funny than scary. The set and costume design are fantastic and really couldn't be better. Erica Zaffarano's set and props (the aforementioned leaf-strewn floor and bare tree fence) are simple and natural and creative - a stack of books for a chair in the schoolhouse, sticks and branches to form a horse. Lori Opsal's costumes are gorgeously distressed and dusty, looking authentic but aged. The hair and make-up is the icing on the cake, the pale faces and dark eyes and lips of the actors accentuating their already over-the-top reactions. At the Sunday church service, the ensemble sings a wonderfully dark hymn, "Death! 'Tis a melancholy day, To those who have no God." Ryan Lear is fantastic as Ichabod, he really embodies this character and is a delight to watch. 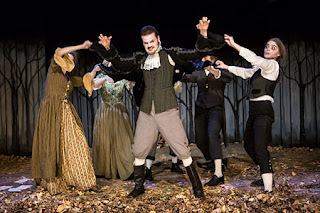 He's backed by a great ensemble (many of whom helped create the piece in its first incarnation at the Jon Hassler Theater in 2010), including Brant Miller as the bully Brom, Joanna Harmon as the ghoulish coquette Katrina, and Casey Hoekstra as the enthusiastic preacher. All of the physical storytelling bits are really clever and effective - the various ways of representing the horse and horseman, the strange little puppet show, the wind blowing Ichabod's coat, and my favorite, Ichabod and Katrina's walk through the woods while remaining stationary in space, with one or the other falling behind when the conversation gets tricky. The Legend of Sleepy Hollow continues through this weekend only. Check it out for something different. Wow, it isn't often a reviewer looks beyond the actors in a show...I'm grateful for the acknowledgment! The lovely thing about working with Jon and John and the other designers AND actors in this show is that, as Jon once put it, in retrospect it is hard to remember who came up with what idea...we were all going for a fun night in the theater...the audience becomes yet another collaborator! Thanks for the mention and thanks for enjoying the piece!